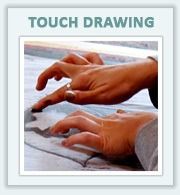 • See the hundreds of presenters for whom Deborah has done Interpretive Touch Drawing. Women of Wisdom: Empowering the Dreams and Spirit of Women Kris Steines 2009 Cover art, essay plus thirty-three of Deborah’s conference drawings were included in this anthology. Deborah has also originated a form of portraiture that she calls the Inner Portrait. 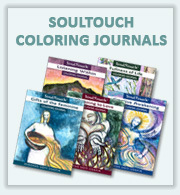 This is a series of Touch Drawings that reflect multiple aspects of the soul. 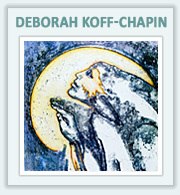 Since her first sitting in 1982, Deborah has completed over 300 Inner Portraits. Studied with NY Times art critic and author, Dore Ashton, and artists Larry Poons, Jack Tworkov, Deborah Remington (studio assistant) Doug Sanderson (studio assistant), Chris Wilmarth, Paul Resnick and others. Received ‘crits’ and experienced lectures from visiting artists such as Roy Lichtenstein, Al Held, Helen Frankenthaler, Agnes Martin and others. Charles Eisenstein, Andrew Harvey, David Spangler, Brian Swimme, Shodo Harada Roshi, Rupert Sheldrake, Joanna Macy, Bill Plotkin, Satish Kumar, Drew Dellinger, Chloe Goodchild, Julia Butterfly Hill, Jane Goodall Ph.D, Jean Houston Ph.D, Rachel Remen MD, Arthur Zarjonc, Caroline Myss Ph.D, Joan Borysenko Ph.D, James Twyman, Mary Evelyn Tucker, Yehzkel Landau, Laura Simms, Gioa Timpaneli, Sherry Anderson, Paul Ray, David La Chappelle, David Abram, Michael Stillwater, Ellias Lonsdale, Ilona Selke, Emily Day, Gina Sala, David Hykes, and many others. 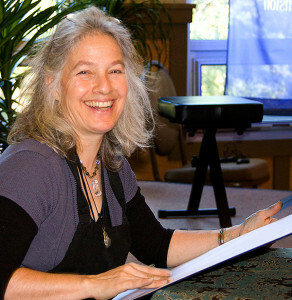 Thirty three of Deborah’s drawings were included in the 2009 anthology Women of Wisdom by Kris Steines, including as cover art. Starhawk, Cindy Dale, Nicki Skully, Normandi Ellis, Jean Shinoda Bolen, Jean Houston, Naomi Tutu, Ubaka Hill, Susan Weed, Caroline Sutherland, Yvonne Oswald, Peggy Dylan, Donna Eden, Joan Borysenko, Starhawk, Libby Roderick, Kris Steines, Sobonfu Some, Kellianna, Susan Armstrong, Jean Shinoda Bolen, Ferron, Barbara Marx Hubbard, Peggy Rubin, Lorraine Bayes, Shauna Carol, Tami Kieves, Barbara Marx Hubbard, Lisa Thiel, Kelliana, Sacred Fire Choir, Delilia, Sandra Locklear, Karen Mehringer, Ann Waldman, Vicki Noble, Cherie Carter Scott, Rianne Eisler, Margot Adler, Shakti Gawain, Sherry Anderson, Paul Ray, Isabel Allende, Angela Davis, Angeles Arrien Ph,D, Marion Woodman Ph.D, Jean Shinoda Bolen Ph.D, Jean Achtenberg Ph.D, Brooke Medicine Eagle, Nicki Scully, Rhiannon, Luisa Teish, Starhawk, Gabrielle Roth, Jamie Sams, Susun Weed, Chris Williamson, Lorraine Bayes, Tickletoon Typhoon, Mary Ann Morrissey, Margot Anand, Jean Houston, Ph, D. and many others. Brooke Medicine Eagle, R.J.Stuart, Orion Foxwood, Michael Dunning, Danielle Creeksong, David Spangler, Robert Moss, Dan Nanakin and others. Deborah has also co-lead many of the the major ceremonial events. Wisdom and Civilization lecture series with James Garrison; Held space for Touch Drawing students to also do Interpretive Touch Drawing during the final lecture. This retreat of ‘Champions’ from every hospital in the system focused on their sharing powerful stories of bringing the spirit of compassion into the everyday life of their hospitals. Keynote address Erie Chapman. On-Stage Touch Drawing during meetings and retreats of Hewlett Packard, Boeing, Sun Microsystems, James River Corporation, Simpson Paper Company and Seattle Center. 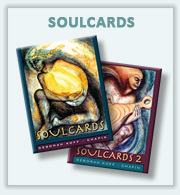 Deborah has fulfilled image commissions from Hewlett Packard for use in corporate graphics. Ruth Inge-Heinz Ph.D, Christopher Lantz, Felicitas Goodman Ph.D, William Gogh Ph.D and many others. Images published with conference proceedings. Father Thomas Berry, Kitaro, Thomas Moore Ph.D, Monks of Drepung Loseling Monastery, Tuva, Frederick Franck, Carmen Moore (Mass for the 21st Century) and many others. Tony Buzan, Dee Dickinson Ph.D, James Machado Ph.D, Reuven Feurenstein MD Howard Gardner Ph.D and others.